A slimy invasive species leaves a trail of ravaged fields and parasitic disease from Argentina to Colombia. 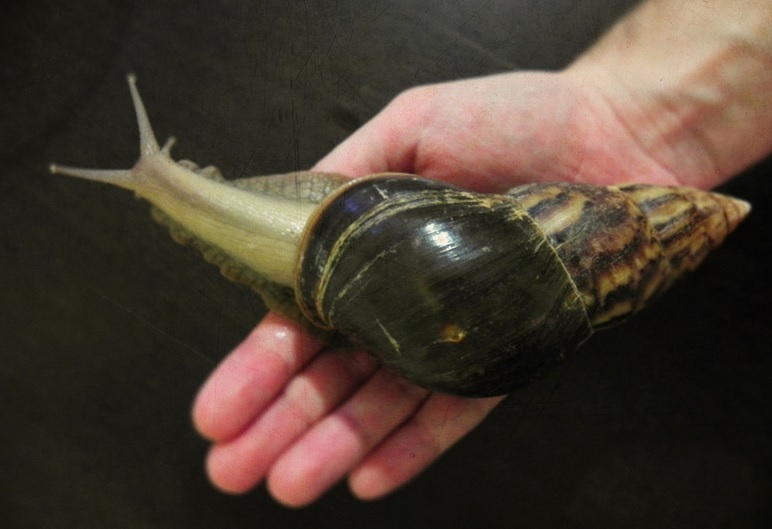 In 1988 at an agribusiness expo in Curitiba in southern Brazil, giant African land snails (Achatina fulica) were heralded as a promising new food source to replace smaller escargot snails. The introduction at the fair was so widely advertised and aggressively marketed that commercial breeders, cooperatives and even private homeowners began rearing the snails–endemic to eastern Africa–immediately with kits sold at the expo. But a booming escargot market in Brazil never materialized. Many of the smaller producers had neither the means to properly process the meat nor the public demand to drive a now flooded market. Frustrated with their failed investment, operations were abandoned and snails were released into the wild in overwhelming numbers. Today, the infestation has spread throughout Latin America–and not at a snail’s pace. They’ve invaded 24 of Brazil’s 26 states, spread through Venezuela and Colombia and have breached the borders of Paraguay, Argentina, Ecuador and Peru–posing both an agricultural and a public health threat. The snails are sweeping the continent carrying parasites and an appetite for most any crop. On paper, the introduction of A. fulica for escargot farming in Brazil appeared promising. The snails are larger than native South American snails – up to 8 inches long and weighing one pound – and grow more quickly than the garden-variety snail typically used for escargot. The snails are also hardy, able to live in a wide range of temperatures and exhibit resistance to disease–a common challenge to raising animals in close-quarters. They could be transported across long distances and arrive fresh and alive for sale. Nothing could go wrong, the producers must have thought. But Latin America’s climate became an optimal breeding ground for the snails. They quickly multiplied. The booming escargot market Brazil had hoped for never materialized. “There is ample territory in South America with adequate climatic conditions for the survival of this species,” says Vogler, referring to a study he and his colleagues recently mounted. In addition to those ecological factors, the snails’ spread has been exacerbated by humans, he says. “Humans are capable of transporting this snail to any place on the South American continent, be it via waste, construction materials, ornamental plants, organic fertilizer, fishing bait or even as a pet.” The snail sperm has even been used as the primary ingredient in Baba de Caracol, a topical cosmetic cream used in Latin America and the Caribbean to treat varicose veins, acne and wrinkles. And the snails pose a voracious threat to agriculture–consuming over 500 varieties of plants–and their effect on the ecosystem can be even worse: overgrazing wetland environments, altering soil properties and outcompeting native mollusk species. They have no natural predators. The snails have spread throughout Latin America, invading 24 of Brazil’s 26 states, into large parts of Venezuela and Colombia, and breaching the borders of Paraguay, Argentina, Ecuador and Peru. Combariza has been tasked with trying to control the invasive snails–both by educating affected Colombian municipalities and snail disposal crews and in some cases getting his own hands dirty killing the snails himself. He points out several precautions that should be taken before attempting to dispose of the snails: 1) Snail should be identified as the invasive Achatina fulica 2) Gloves should be worn before handling the animals 3) Snails should be killed with either molluscicides or through asphyxiation, both within plastic bags 4) Snails should always be disposed of in their own plastic bags. Today many South American countries, including Argentina, Colombia and Venezuela, have drafted management plans to study the snails, prevent their further spread and protect their citizens from the health risks associated with their consumption. The snails are a known vector for nematode worms that can cause different forms of meningitis in the head and abdomen. In fact, 42 people have reportedly died in Colombia following exposure to disease-carrying snails. Contact with live or dead snails is therefore discouraged. Experts like Combariza suggest that improved quarantines of international cargo can be effective in detecting and preventing the further spread of the snails. If snail populations are caught early and attacked aggressively eradication efforts have proved successful. African snails are listed as one of the top 100 most dangerous invasive species worldwide according to the IUCN’s Invasive Species Specialist Group. (The species on the list are not ranked but simply nominated for the distinction of “Top 100”.) In September 2011, Achatina fulica snails were even found in Miami, Florida, sparking an immediate, molluscicide-based, and largely successful extermination effort. Hawaii has had less luck. Roberto Vogler, the Argentine invasive species scientist, looks at the invasion as a complex issue for Latin America. “Some of our countries have full knowledge of the presence of this species while for others the presence has not even been confirmed except by unofficial reports.” If Latin America is to protect itself, Vogler says, countries have to secure their borders and avoid allowing the snails to disperse into new areas. Meanwhile, Ricardo Combariza continues to visit rural regions in Colombia to teach authorities how to dispose of the snails. He, like Latin America, faces an uphill battle against a small but persistent pest. Additional reporting by Aleszu Bajak. Image Credit: premedito via Flickr.